This bar is my favourite hangout bar in the Eppendorf neighbourhood. 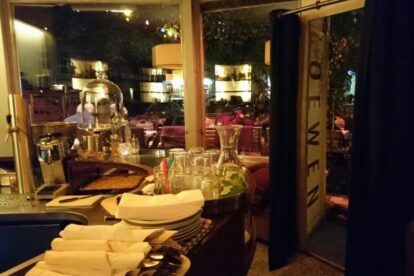 The nice seats, cosy lighting and very friendly staff make it a gem for people who just want to relax and take a side step from all the poshness that usually resides in Eppendorf. They have cakes till late and good teas, coffees and hot chocolate – alright: and wine. It happened that I sat there with my friends chatting over just one tea and more and more and more time passed but still we never had the feeling of being in a hurry. Instead, it was like we were sitting in our living room with someone caring for us and always available if we needed another drink. The waiters are even very dog friendly, which is a huge plus for dog lovers (not that there are always dogs here, but if you need to find a spot: it is here). Smooth music in the background, your (furry) friends around you and a nice cuppa… Perfect!